Book now and discover the many benefits of Colon Hydrotherapy. Colon Hydrotherapy is a gentle way of cleaning your colon and reactivating its natural movement. This will in return help your body get rid of toxins building up over time. It is a natural safe procedure that has proven itself over centuries and since ancient times. Rafaa is a specialized mixture of live probiotics (good bacteria) and organic acids that our body desperately need on a daily basis to keep itself healthy and energized. 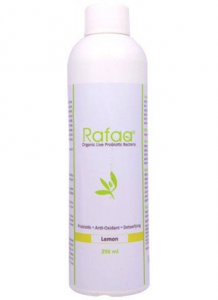 Rafaa is specifically designed to help strengthen your immune system and regulate the pH balance in your body. regular doses, helps with numerous ailments. All my clients receive an electrolyte implant as part of your treatment at no extra cost. Electrolytes are the smallest of chemicals that are important for the cells in the body to function and allow the body to work. Electrolytes such as sodium, potassium, and others are critical in allowing cells to generate energy, maintain the stability of their walls, and to function in general. They generate electricity, contract muscles, move water and fluids within the body, and participate in myriad other activities. In addition to Colon Hydrotherapy, I offer several products and additional treatments to assist you on your path to improved health. Coffee implants are powerful detoxifiers as their compounds stimulate the liver to produce Glutathione S-transferase. This robiotic reduces systemic toxicity by up to 600% by binding to the toxins and then removing them from your body along with the coffee. Spirulina is a natural “algae” (cyanbacteria) powder that is incredibly high in protein and a good source of antioxidants, B-vitamins and other nutrients. When harvested correctly from non-contaminated ponds and bodies of water, it is one of the most potent nutrient sources available. It is largely made up of protein and essential amino acids, and is typically recommended to vegetarians due to its high natural iron content. Probiotic enemas flush out the colon and replenish the good bacteria that colonise this part of the digestive tract. They also improve the symptoms of a number of bowel disorders and long-term chronic conditions such as candida, colitis and IBS.